Seagrove by the Sea IIE is a spacious gulf-front penthouse designed with comfort and hospitality in mind. This welcoming 2400 sq. 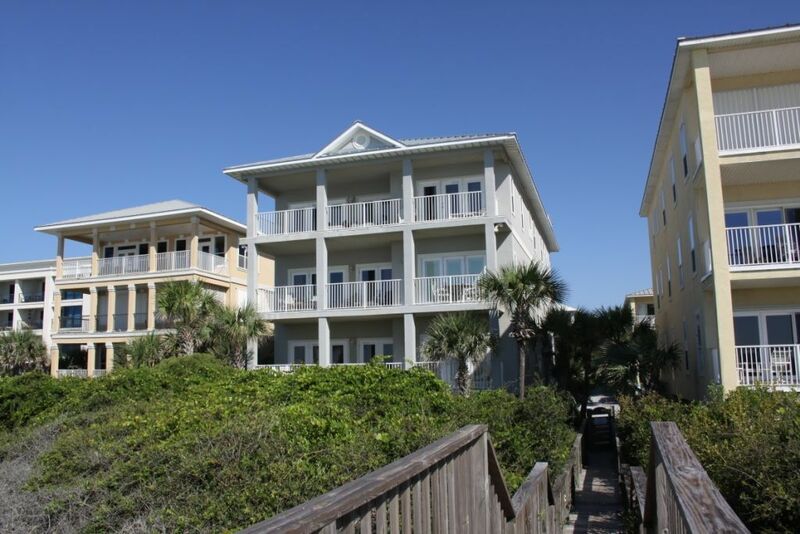 ft. four bedroom, three bath beach retreat occupies the entire third floor of a three-story building and has an elevator to whisk you the unit. Four cushioned chairs and cocktail table as well as 2 additional side chairs line the expansive gulf front porch, so you can relax and enjoy the breezes, sounds of the surf, and sensational sunset views. Spacious living and dining areas feature antique, wide-plank pine flooring, giving it a uniqueness all its own. Living room is outfitted with 2 sofas, 2 plush side chairs, ottoman, coffee table, 2 lamps, built-in shelving stocked with books, LCD TV, DVD, HD Cable Receiver with all the Movie Channels and Bose stereo with CD player and Smartphone connectivity. Farm style dining table 8 plus card/game table that seats four. The adjacent kitchen and central island bar which seats 4 allows for lots of room for everyone to gather. The fully equipped custom gourmet kitchen has granite counter tops, pantry for food storage, new appliances including French door fridge with icemaker, separate ice maker, dishwasher, microwave, and glass-top range. Other features include wireless hi-speed internet access and free long-distance telephone service, which makes this the perfect home for people who need to stay in touch. Gulf-front Master bedroom features a king bed, 2 bedside tables, 2 lamps, dresser with mirror, armoire with large LCD TV and blue ray DVD player, side chair with ottoman, French doors to the balcony and closet. Private master bath includes double vanity sinks, jetted spa tub and walk-in shower. Three bedrooms and two full baths complete the sleeping arrangements. One bedroom has a king bed, 2 bedside tables, 2 lamps, chest of drawers, closet, armoire with LCD TV and door to shared bath. Twin bedroom has 2 twin beds, chest of drawers, lamp, closet, LCD TV, side chair and door to shared bath. Shared bath has double vanity sinks and tub/shower. Queen bedroom has nook with bunk beds (2 twins), 2 bedside tables, 2 lamps, armoire with LCD TV, DVD, closet and door to the adjacent bath with vanity sink and tub/shower. Washer and dryer in a hall closet. Just steps away is a glistening 15 x 30 community pool, which is shared by only four other units. Pool is surrounded by multiple loungers, tables and chairs for your comfort. Dedicated parking for 1 car plus two more can park under the building. The spots under the building are shared by all building occupants and are for compact cars only. Private walkway leads directly from building to our beautiful white sands beach. Gas grill for the building is kept in the area underneath close to the gulf side. Seagrove by the Sea is one of 5 units in Seagrove by the Sea, a small, exclusive and gated Gulf front community in the eastern part of Seagrove Beach. Sunburst Beach Vacations manages another unit in this neighborhood. Seagrove by the Sea IIC is the same layout as this unit and is on the first floor of the same building. Great views and not too crowded on the beach! Unit was equipped very nicely and top of the line appliances. Would definitely go back. Only a couple of issues, like the locks on some of the bathrooms are broken, nice food processor but was broken also. Also, they could definitely have more seating and maybe a table down by the barbecue area. Only 2 chairs and we had a group!! Overall I would recommend. Thank you for sharing your experience! We will certainly take your feedback and improve upon those items. We are so glad you enjoyed your stay in "Seagrove by the Sea IIE" and we hope to host you again! Great property. High end appliances, well appointed and outstanding views. Not a complaint to be had. We will look for this rental again next year. We are so glad you enjoyed your stay in Seagrove by the Sea IIE! Thank you for sharing your experience--we look forward to hosting you again! This was a perfect property. Super location! The unit was decorated great and was super clean. The kitchen had everything! Super easy check-in and check-out. My family loved our week at this home! Great space, lots of room, clean..grill was a disaster however it was replaced as soon as we called. pool was very dirty & had a pump/filter issue that made a constant loud noise the entire week. They did come clean it when called..overall perfect location with comfortable beds & linens..patio furniture very nice & comfortable with spectacular views. Would definitely rent again. Beautiful kitchen and hardwood floors! Everything was clean and well kept. Great washer and dryer. Beachfront, nice area underneath to grill, be sure you remember to keep the gate code handy as you will be sitting on the edge of the busy road trying to get in. Elevator slow but wasn't a problem. Bed linens and towels very nice and seemed new and clean. Great view and balcony also.